Escape the urban bustle at Akumal Beach and Playa Paraiso. Get some historical perspective at Ruinas Mayas de Tulum and Cobá Zona Arqueológica Cobá. 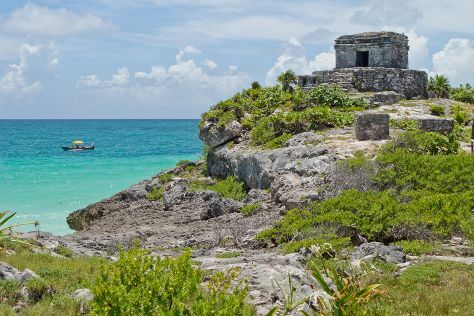 Change things up with these side-trips from Playa del Carmen: Cancun (Swim with Dolphins, La Isla Shopping Village, & more), Scuba & Snorkeling (in Cozumel) and Grand Cenote (in Tulum). Plan for a day of cool, family-friendly fun on the 3rd (Tue) at Xel-Ha. The adventure continues: make a splash at Xcaret Eco Theme Park, get the adrenaline pumping with an extreme tour, and make a trip to Quinta Avenida. For traveler tips, reviews, ratings, and tourist information, go to the Playa del Carmen online itinerary creator. If you are flying in from Australia, the closest major airports are Cozumel International Airport and Cancún International Airport. April in Playa del Carmen sees daily highs of 33°C and lows of 23°C at night. Finish up your sightseeing early on the 8th (Sun) so you can travel back home.